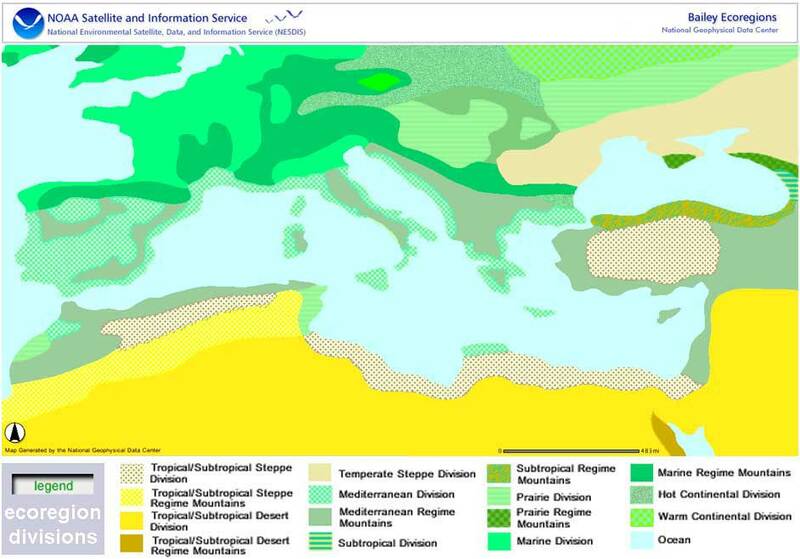 The above National Geophysical Data Center (NGDC) map is a Mediterranean & surroundings excerpt from the Bailey Ecoregions Map of the Continents which characterizes global climate and potential natural vegetation at approximately 1/2-degree resolution. The data set is based on a Russian vegetation map (Gerasimov, 1964) which was updated by the US Fish and Wildlife Service (Robert G. Bailey, 1989/1993), however the geographic projection was unknown. This version was reprojected to geodetic coordinates at the World Conservation Monitoring Center, England.